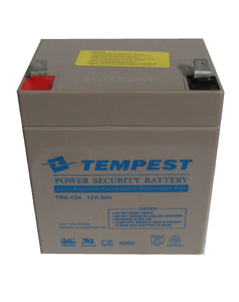 You may use the TR5-12A or the battery listed below for the same application. 12 volt, 5 Ah for use in Emergency Lighting, Medical Devices, UPS Systems, Alarm Systems, and general purposes. Length 3.54", Width 2.76", Height 3.98" (Total Height 4.21"), F2 terminals .250", Approx Weight 4 lbs.